I am thinking about joining the Victorinox Swiss Army Knife Collectors Society. While I am a big fan of online forums, communities, blogs, etc., I think it would be nice to be a member of a “traditional”, offline society. Actually, they do have a website, but there is not much happening there. 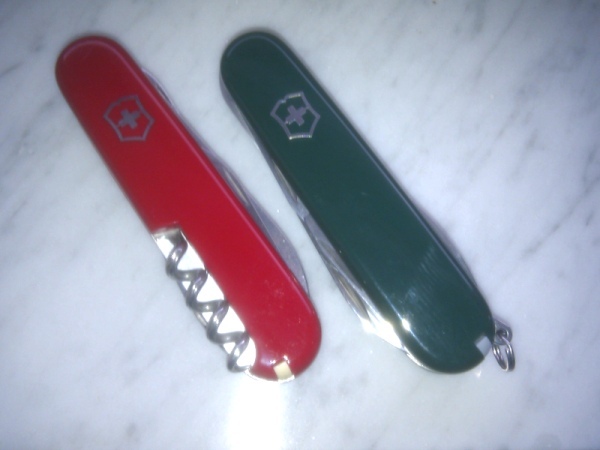 Yesterday, I received two Victorinox knives from a nice chap from the MultiTool.org Forums. The seller called the red one a Tourist, but I think it’s a Traveller, which is basically a Climber without the keyring. Which is obviously not the same as the modern Traveller (with an electronic timepiece, thermometer, altimeter, etc. in the front scales). This Traveller has a company logo on the front, so the Victorinox logo is on the rear (the corkscrew side). The Camper has green cellidor scales. It’s a relatively uncommon color and I think it’s one of the nicest.